April - May 15: $119/nt. May 16 - June: $109/nt. Just opened & priced to fill the first year fast! *Just* opened – brand new to vacation rental market. If you were looking for a great deal in Central Maui, you’re in luck as the rates offered are super low and will be raised soon! Wonderful clean 1BR house in a small old-hawaii-style duplex in Wailuku Town. This home has been lovingly well maintained to retain its historic character, while having been remodeled where it counts (like the kitchen!). Private off-street parking. Central Maui location in the heart of Wailuku Town where you can walk to an eclectic variety of shops. This cute plantation-era Wailuku Town house is absolutely perfect for adventurous visitors who are looking to escape the touristy trappings of South and West Maui. This is a safe, inexpensive and central home-base to adventure all over our wonderful island. Although the unit is new to the market, the owners have two exceptional vacation rentals in West Maui that have been running for a few years now, and have received top ratings from guests – this new unit promises the same! This 1BR house has a queen bed and a/c in the bedroom, and a sofabed for extra guests in the living room. The living, dining and kitchen areas are an open and airy light-filled floorplan. Optimally located jalousie windows allow the sweet tropical tradewinds to blow though the home so you probably wont ever want to turn that a/c on anyway! The owners are wonderful and also own and operate a business immediately adjacent to this house. While they are quite nonintrusive and respect their guests privacy, they are also available to talk story and share their favorite local dining and exploring tips! Located in the heart of old Wailuku Town, just ten minutes from the airport. This location is perfect for folks who plan on exploring all around Maui (something I suggest no matter where you stay!) It’s also worlds away in attitude and experience from the touristy hotels and resorts. Wailuku is the capital town of Maui; completely non-touristy and down to earth. Compared to mainland cities, Wailuku is a sleepy laid-back small town, a throwback to much simpler times. In recent years Wailuku has seen a resurgence, with an eclectic array of hip shops and restaurants opening up alongside old-time Maui standards. You can walk all of Wailuku Town from this very central location. Examples of what you might find strolling around the neighborhood: hip coffee shops, local clothing boutiques, hair salons, all different manner of inexpensive restaurants that aren’t on the tourists radar, antique stores, island-style pawn shops (with items like surfboards and Hawaiian antiques and jewelry you wont find in the resorts), a funky record store, yoga studios, the Maui Academy of Performing Arts, a smoke shop, historic Iao theater, a sushi bar, art galleries, a crystal shop, an authentic tiny New York style pizza joint – and so much more! Bonus: the first Friday of every month there is a block party where folks come from all over Maui to hang out, listen to live music, eat and browse the local vendors wares. Moving outside the town, you’re also situated just a couple minutes before where the amazingly picturesque West Maui Mountains split to open into historic and sacred Iao Valley. 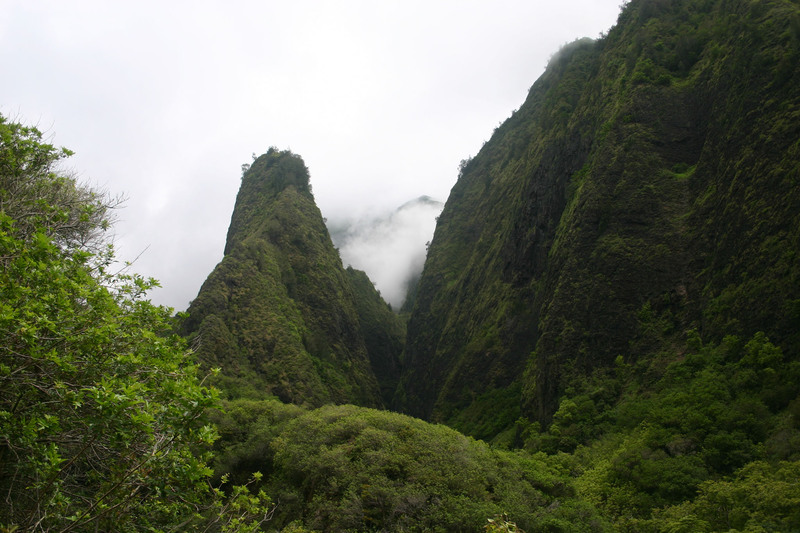 Iao Needle – View from observation deck. 15 minutes in another direction takes you to the Maui Ocean Center and the Maalaea harbor for snorkel boats and whale watches. You’re also five miles from Maui Tropical Plantation and and you’re just 15-20 minutes from the resort areas of Kihei & Wailea. Half an hour will get you to West Maui’s Lahaina Town. You’re also closer to a Road to Hana adventure, and also to Haleakala than the resort areas are. For wind and kite surfing, and downwind enthusiasts, Kanaha, Kite Beach and Kahului Harbor are just minutes away. An incredible value for your travel dollar when you consider what resort lodging costs – and the unique value added experience and authenticity that comes alongside is invaluable.